Discussion :: How Are Those New Races Working Out For You? (image courtesy of Penny Arcade. Click to see the original comic! Cataclysm has been out for a while, and although many people have spent the bulk of their time rushing to get up to 85 and geared up for heroics and other dungeons that represent the state of end-game content right now, a lot of other people have taken the other approach: take it nice and slow, and roll on the of the new races or character race/class combinations, start from the beginning, and take your time getting through all of the new quests, changed zones, and updated content. So, if you’re one of those folks who decided to roll a goblin or worgen and start from level one, how are those races working out for you? Do you find the lore works out for you, or that it’s all just a smashed-together trainwreck? Some people have noted that the Worgen feel kind of abandoned, much like the Draenei were in The Burning Crusade, that they’re essentially leveled to about 10 or 15 and then shipped off to do quests that essentially already exist and join the storyline of another race (namely the Night Elves.) The Goblin experience, however, is much better – but this is all secondhand that I’m hearing. What I want to hear is what you think! Sound off in the comments. Posted in Cataclysm, Discussion, Expansions, factions, Lore | Comments Off on Discussion :: How Are Those New Races Working Out For You? I’m the type of person who loves to spoiler myself on things like this, but I absolutely hate spoilering other people – so if you’re not interested in finding out what happens when we eventually confront Arthas in Icecrown Citadel and what happens with him and other major figures up to this point, stop reading now! Seriously, the video of the cinematic is after the jump. DO NOT CLICK if you don’t want to be spoilered. If you do want to be spoilered however, please, by all means, read on. First MMO Champion said it, then WoW.com said it, and now that it’s been a few days since both sites leaked information that is rumored to be details from the upcoming expansion that’s also rumored to be called World of Warcraft: Cataclysm, the dust has settled a bit and revealed a few very important things. First, let’s take a look at the news that’s caused such an outrage, shall we? I’m skeptical, to a very large extent – some of the race/class combinations don’t really make sense, and the lore implications of both Goblins and Worgen and some of the changes to the fundamentals of the game (flying in Azeroth, starting zones changing, etc) are pretty wide ranging and sound like either they must have been in the works for years, or it’d be an awful lot of work for this next expansion. But unlike a lot of people (and I’ll get to this later) just because I don’t want something to be true doesn’t mean that it might not be – we’ll see. As to the notion of Goblins and Worgen, I hit on that in a previous post, but let’s dive a little deeper, shall we? So we know that the worgen made their appearance in Azeroth thanks to Velinde Starsong and Arugal, both of whom started summoning worgen into the world for their own reasons. Need a history lesson? Cadistra of WoW, Eh has an excellent primer as this week’s comic. Velinde prayed to Elune for a weapon to help her clean up Felwood and push back the corruption, and she got that weapon in the form of the Scythe of Elune (which makes an appearance in Northrend as part of a quest chain where you essentially give it back to a group of worgen in Grizzly Hills before you know what they are). She summons more and more worgen into Azeroth and uses them essentially as weapons of war – until she loses control of them and presumably she dies at their hands – that quest chain is woefully unresolved. Arugal on the other hand was a mage of the Kirin Tor who saw Dalaran overrun by the scourge and, frustrated with the Kirin Tor’s seeming inability to cleanse the scourge from Azeroth started summoning Worgen into the world from Shadowfang Keep to – that’s right – use them as a weapon of war against the scourge. Arugal’s worgen were fairly effective against the scourge, but as if the two events were scripted together, the same thing happened to Arugal that happened to Velinde: the worgen turned on their masters and started killing them outright. So then, it’s clear that the worgen would have no love for the scourge, but I’m curious how Blizzard will explain their siding with the alliance. It would seem to me they would be a better match for the Horde. The Goblins are the opposite. They used to be members of the Horde in the Warcraft II and Warcraft III (pre-Frozen Throne) storyline, but left after the Second War in favor of neutrality when they realized it would make them a ton more money to trade with both the Horde and the Alliance. While they may not harbor any specific hate for the Horde, it’s curious why they would break neutrality to join the Horde again, especially considering the fact that they broke with them once. It would almost make more sense for them to join the Alliance, especially in light of the other rumors about the Horde…unless something happens to make them really attractive to the Goblins, or unless Blizzard just wants to make them the equivalent of Horde Gnomes. The new race/class combos, as some have asserted, may be indicative of the rise of some of the various factions in the game that aren’t directly allied with the capital cities. Dwarven Shamans could be Wildhammer, for example. In any event, only time will tell whether this is all just rumor and speculation or whether it’ll all come to light. We’ll find out as news filters out of Blizzcon next week! That being said, I hardly think that sites like MMO Champion and WoW.com would risk their credibility with the fan community by reporting on these without being confident in their sources, and I highly doubt they would post this kind of information just to stir up this kind of trouble. That brings me to a more nuanced point about journalism, ethics, and anonymous sources, but definitely a digression, so I’ll put it behind the jump below. New Expansion, New Races Leaked? So WoW.com had the scoop today: a full-on leak that the new expansion will be called World of Warcraft: Cataclysm, and two new races will be introduced in the expansion: Horde will get Goblins, and Alliance will get Worgen. Huge news, right? A massive leak, right? Well, a number of World of Warcraft blogs and sites have been speculating this to be the case for a while now in separate theories. First, when Blizzard trademarked the phrase “Cataclysm,” speculation ran wildly high that the next expansion would be called Cataclysm. Then, when someone dissected models from a recent update and discovered that pretty high quality male and female Goblin and male and female Worgen masks had been added for the Halloween event, speculation ran wildly high that they would be the next two playable races to make their way into World of Warcraft. So the rumor mill has been turning furiously for the past several weeks, if not months, to the point where the discussion is all but a cacophany. Is WoW.com correct? Their anonymous sources have been right before, so there’s no reason to doubt them other than the fact that this is a completely unverified leak – and I don’t say that sarcastically. Until there’s an announcement from Blizzard, this is just more speculation. And something I’ve learned the hard way from being in the technology profession (and being a particular fan of Apple, for example) is that there are certainly spoilers and leaks available all over the Web, and no matter how many images and evidence you may have to support them, any spoiler at any time can just as quickly become what’s called a “foiler,” of a seed planted by a company to drum up discussion, support, and attention in advance of a major event. Could Blizzard be leaking this information to drum up anticipation prior to Blizzcon? Sure. Could they walk out on stage at Blizzcon and say something completely different about the next expansion? Absolutely. We just don’t know yet, and shouldn’t pretend that we do. That being said, I have incredible respect for WoW.com and if there’s anyone in the Warcraft blogging world I trust and believe about something like this, it’s them. So it’s a double-edged sword. If there’s any source I consider credible that’s not Blizzard, it’s WoW.com, but I don’t want to make plans for a Worgen hunter or a Goblin rogue just yet. In any event, if this is the case, I’m incredibly curious what the lore behind this will be. Both races already have a pretty well defined and well laid-out history and story in the World of Warcraft, and while the Worgen are semi-new to the universe, Goblins have been around for a good long while. Even so, just because we can explain how the races got into the game doesn’t mean we can explain their faction choices – for example, the Worgen were initially summoned and controlled by a Night Elf and used as essentially a private army. They then revolted. Why would they side with the Alliance? The Goblins have long been neutral – will they continue to be, or will there be Goblin factions where some are neutral and others have chosen a side? There’s obviously more room to play with the Worgen than the Goblins, since the Goblins are essentially already in the game, but there’s only so many ways you can work the Worgen into the Alliance. 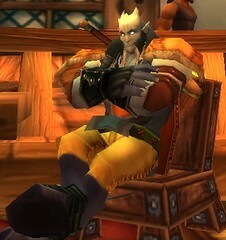 Will they be another Draenei-like faction where the playable ones are the “good ones” and some corruption has turned all the other ones you essentially slaughter en masse in Darkshire “evil?” Will the Scythe of Elune – the one you learn about in Darkshire and essentially wind up unwittingly handing over to the Worgen in Grizzly Hills (who seem to be a more sentient, sapient type of Worgen that can disguise themselves as humans when necessary) – play a role? Where will the starting zones be, and should we expect the opening of the Greymane wall and the unlocking of Gilneas? What about the Goblins – where will they start? Alternatively, we could be faced with something a bit more dark and sinister – the Alliance may not retain is’t pearly white veneer in the new expansion – the Draenei joined the Alliance because they thought of them as the “good guys,” and the Blood Elves, as misguided as they were, joined the Horde out of convenience and because they kind of fit over there. Maybe this time the Alliance get the “bad guys” because of Varian Wrynn’s opportunistic desire to use any means necessary to destroy the horde – maybe the Worgen are still under the influence of the Scythe? Maybe the Goblins are tired of taking a backseat to the action and decide to side with the cause they see is more righteous. Who knows. To that end, what about the “Cataclysm” itself? Does the Cataclysm represent what we all expected it to be, and allude to the Sundering? Do we get to push back the Naga, now eager to raise themselves and their queen from the bottom of the sea under the Maelstrom to reclaim the land and crush all those who live above the surface? Do they have a far more sinister plot? Basically it goes like this: Algalon is an ethereal agent of the Titans, Azeroth’s creators. He’s detected the death of Loken (when Loken said: ‘My death heralds the end of the world’, he wasn’t kidding) and that Yogg-Saron has tried to escape his bindings. When you engage him, he is about to do a scan to determine whether Azeroth needs ‘reorganising’ by the Pantheon, his Titanic masters. Said scan takes an hour and you have that long to defeat him. If you fail he sends a signal and the fate of Azeroth is sealed. Of course, some guilds have fought Algalon and won, others have lost and the timer runs out, but Azeroth is still here and the world hasn’t ended. [The] Results could be cataclysmic. I recently heard someone (I’ve forgotten who – sorry!) on The Instance mention the Draenei in the context of the other Alliance races – what is their deep, dark secret? Every other Alliance race has a tarnish, from the gnomes’ senseless forays into uncontrollable technology to the elves’ storied flirtations with dark forces. But the Draenei seem to lack a shadow; they come across as big, blue, hammer-wielding teddy bears. As a kind of answer to that question, I offer two narrative points: that the Draenei don’t need a dark history and that they probably shouldn’t have one. With Blizzard recently announcing the inclusion of Dranei shamans and Blood Elf paladins, the gulf between the Alliance and the Horde is now even greater. In a game balance sense, there is more parity between them, but I foresee an even deeper fracture between players. Faction loyalty is pretty rampant as it is, as I recently observed. I wanted to explore the Horde content, so I made a shaman. How many people do the opposite, explore the Horde content so they can make a shaman?